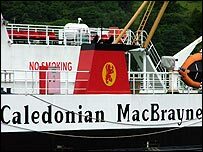 State-owned ferry operator Caledonian MacBrayne is to be split into three new companies from October. One of the companies is registered in Guernsey in the Channel Isles, resulting in substantial tax savings. The bulk of administrative staff will remain based at Gourock in Inverclyde, while ownership of the ferries will be transferred to a third company. The RMT union said it had been reassured by guarantees that staff pay and conditions would not be affected. CalMac management said this could help it to become more competitive during the tendering process for its own routes. The winner of the first tender, for the Gourock to Dunoon route, is expected to be announced at the end of October. CalMac and Western Ferries have both tendered for the contract.